Before you open a catalog or look at a website, spend time deciding what your goals are for high school. You will never know exactly how things will look at the end but you need a direction to aim those homeschooling arrows. Shooting arrows when you can’t see the target is pointless. It is so much better to clearly see the bulls-eye before taking aim. Pointing your academic and spiritual arrows with skill takes effort and practice but it can be done. Block in those courses that are a “must” by mapping out a sequence to get you to where you need to be at graduation. For instance, if you want to complete four years of math and want to work through Calculus, work backwards to see where you will start in your freshman year. If you want three years of Spanish study, decide which years you will block in Spanish. Leave room for being flexible and changing of courses to fit any refined interests or opportunities that come up. If you go through this process ahead of time, you will buy far less curriculum that may be wonderful and interesting but will end up sitting on your shelf because you can’t do everything. Plan for scheduled and unscheduled time. Some of your child’s interests can be pursued outside school hours. Your timing is always perfect for me. Thank you for this! Shooting arrows… I like that!! Thanks for your timely post. I am enjoying reading these tips. 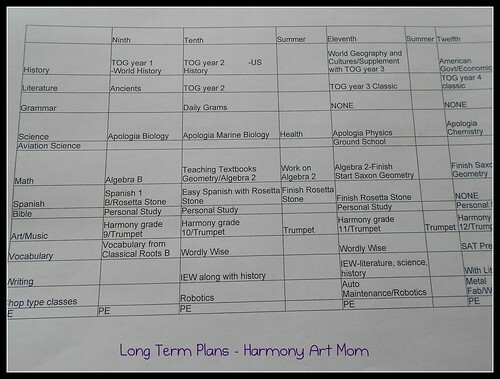 My older son decided to return to public school for high school, so I had a reprieve in high school planning. However, my younger son, seems to be headed on a different path. He’ll be in 8th grade in the fall. Your posts have prompted me to start thinking about his high school plans. That’s what we’ll be doing very shortly! Setting our oldest’s high school goals. Boy does time fly. I so appreciate the time you put in to mentoring those of us who are on the way to high school.